Organizers unveiled the medals Thursday for the 2014 Sochi Olympic Winter Games featuring a "patchwork quilt" design representing the various regions of Russia. Sochi organizers unveiled the medals for the 2014 Winter Olympics on Thursday and now hope to make sure most of them stay in Russia to make up for the miserable medal performance at the 2010 Vancouver Games. Organizers presented the medals featuring a "patchwork quilt" design representing the different regions of Russia, which will be hosting its first Winter Games next February in the Black Sea resort. One of the first to get a close up look at the medals was Russian president Vladimir Putin, who inspected them during a visit to the SportAccord conference and a lunch meeting with International Olympic Committee officials. 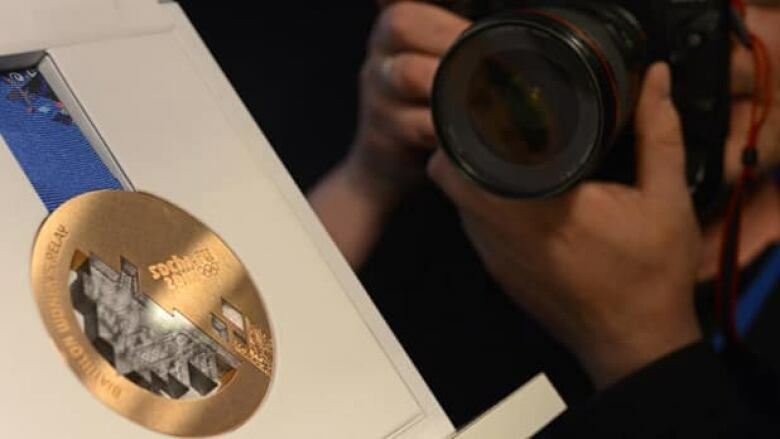 A record 1,300 medals are being manufactured for the Olympics and Paralympics. The medals depict the sun's rays reflecting through a prism of snowy mountains and sandy beaches. The medals are 0.4 inches thick and four inches in diameter. The Olympic gold medals weigh 16 ounces. A total of 6.6 pounds of gold was used to make the medals, which are gold plated. "We'll try to keep all these medals in Russia, especially the gold ones," Sochi organizing committee chief Dmitry Chernyshenko said. Russia wants no repeat on home turf of what happened in Vancouver, where it recorded its worst ever performance at the Winter Games. In Canada, Russia won only 15 medals and finished 11th in the table. The results led to the ouster of four key executives in the nation's Olympic program. Medals in Sochi will be a matter of national pride for Russia and Putin, who is directly involved in overseeing preparations for the games. The Russians are working on their own version of Canada's "Own the Podium" program, a $117-million initiative that resulted in 14 golds for the Canadians — more than any country at a Winter Games. Chernyshenko said Russia's medal performance will be crucial to the success of the Games. "We refrain from making medal forecasts, but the atmosphere of the games will be affected by the performance of the team," he told reporters. The Sochi Games will feature 12 new medal events, including snowboard and ski slopestyle, ski halfpipe, snowboard parallel special slalom, womens' ski jumping, figure skating team event, luge relay and biathlon mixed relay. The front of Sochi's medals features the Olympic rings. The reverse side has the name of the competition in English and the Sochi logo. The official name of the games in Russian, English and French is engraved on the medal's rim. The Paralympic medals were designed in the same style. One side features the Paralympic symbol, the reverse has the logo of the games and the name of the competition in English. The medals also contain inscriptions in Braille for the visually impaired.